Zayd Nasir Sheik is just 17 years old. But his young age has not prevented the tech-savvy teenager from giving wing to his entrepreneurial dreams. MANGALURU: Zayd Nasir Sheik is just 17 years old. But his young age has not prevented the tech-savvy teenager from giving wing to his entrepreneurial dreams. Well versed in technology, the thought of doing something in digital marketing has been at the back of his mind for the past two years. Finally, Sheik decided to take the plunge and capitalise on his interests. 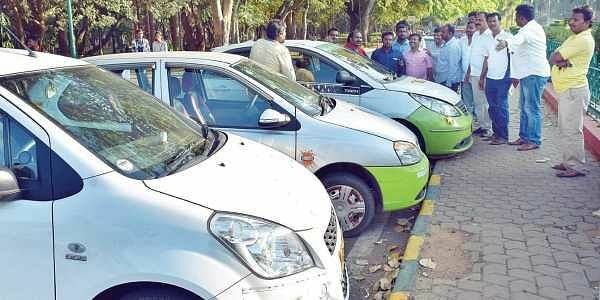 The result was an app-based taxi aggregator service, which he launched with a fleet of 110 vehicles in the city on Sunday. He named it ‘Ajra’ which has its roots in Arabic meaning ‘rental’. Apart from helping connect 100-plus cabbies with a clientele, Sheik has come up with a business model that aims to address the problems of these cab drivers who have been part of other taxi aggregators in the city. The plan is simple — instead of “high commissions and extra deductions”, Sheik will charge the cabbies a nominal fee of `25 per day, excluding taxes. And there is something for customers too. They can get free rides after accumulating points on the app. These points will be added based on their interaction with the advertisements on the app. Through this model, the company aims to break even. While also depending on ad revenue, Sheik will keep the prices competitive. “It is 15 per cent cheaper than any other cab,” he said. After working on the concept for two years, the company was started as a partnership with an investor, said Sheik, adding that he worked out the initial algorithms and was course-corrected by his father and uncles who work in the Gulf. Sheik came up with the whole concept when he was looking to start a targeted marketing and advertising firm. “However, while working on that dream, I realised that I needed huge visibility for that and decided to go with a cab service as they have customers of all ages,” he said. So, he started working on Ajra Cabs.